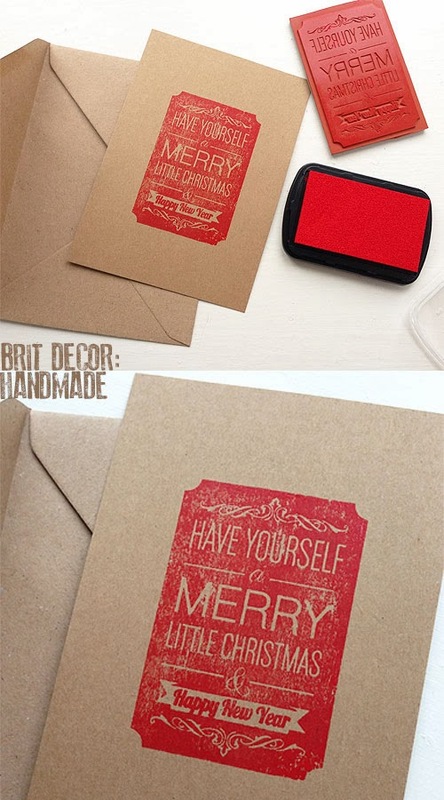 Does anyone else become overwhelmed with the urge to craft and create in the run-up to Christmas? Well no prizes for guessing that I have been busy rolling up my sleeves for a little bit of festive creativity! My brief was to go for a handprinted look with something of a vintage 1930's feel (it's been a very 'Gatsby year' you know) so this Indigo blu rubber stamp really ticked the boxes. I wanted to keep the overall design simple and I loved the natural feel of these recycled postcards and envelops. In keeping with my vintage theme, I opted for a very traditionally festive red ink which offered the perfect contrast against the textured brown card. There was something extremely satisfying and therapeutic about gently dabbing the stamp against the ink pad and then hand-printing it onto the card. The end result was exactly the look I was hoping for and I can't wait to start posting them out to friends!